The furniture of this office was sourced from antiques dealer Nicholas Grindley in London, there is a 19 th-century Hong Mu desk with cracked ice design and a set of four horseshoe armchairs dressed with stylish contemporary padded cushions for extra comfort. 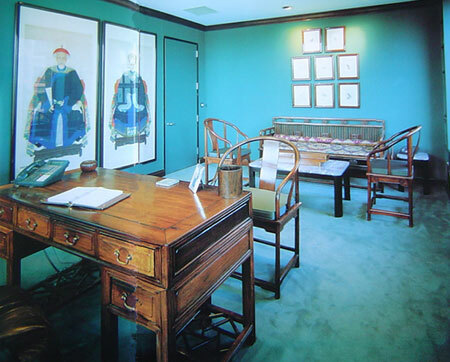 On the wall is a pair of ancestor portraits, purchased in Hong Kong, which look down over the modern day business proceedings. 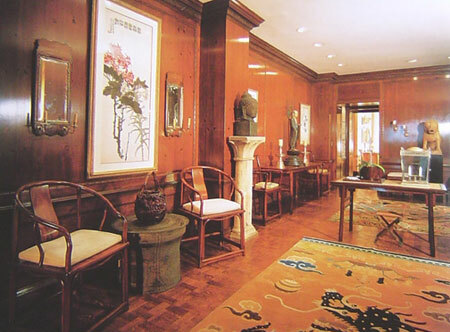 At the end of the room is a spindle-back settee, also made of Hong Mu. 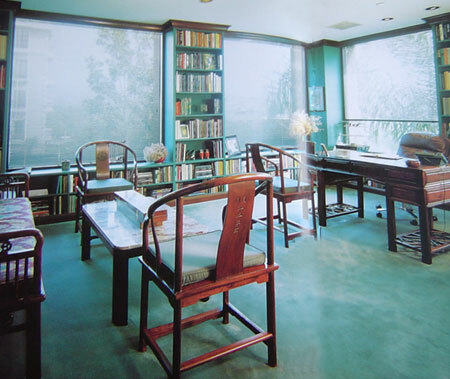 Light filters into the office through three large windows shielded with blinds. The wooden ceiling and flor mouldings have been stained in the same shade as the Huanghuali document box (on the marble coffee table) and the Huanghuali table, which hosts a 15-piece group of seated tomb musicians from the Northern Wei Dynasty (386-534). The calligraphy brush set and rack was a gift and is merely decorative.